If I may ask, though, to what do we owe the accelerated post production time, given that historically, the process has been a tad more methodical? It worked best with everyone's schedules to go into production two days after the tapings this time. I know Shimmer isn't going to do a TV show or PPV any time soon, if ever. So I've had another thought. Should Shimmer try and get a spot on Comcast On Demand? I know there's a wrestling section in the Sports and Fitness section where WWE, TNA and other companies (Dragon's Gate) have stuff. I imagine that money would be the biggest obstical, but it would be a way of getting it's name out on a massavie scale. They could have an Intro video talking about the company, what it's about, why they do it, esc. Maybe a video covering the top stars (Del Rey, Haze, MsChif, Melissa, Kong). Offer a few free matches to view and finally offer some of the full volumes to view at a price, say $7.99. Some of our early stuff that we put in retail was available on demand on a few cable systems. It did nothing for us. We're still owed a ton of money by Big Vision Entertainment (enough to cover several tapings), which we will probably never see. To be honest, it has soured me on dealing with anybody outside of our current team in terms of distributing our product in the future. We're doing fine with our current business plan. This has probably been asked before..but when volumes become sold out, do they eventually restock or no? DP re-released volumes 1 and 2 in a Collector's Edition set based on the enthusiasm for people to own it - so he did re-prints, and people who said they'd buy it... didn't. I did though, because I'm good like that. When can we expect another Music Video, Covering the last few volumes? Big Vision screwing someone over and owing them money... why am I not surprised? It's a shame. But, if it means anything (and it likely doesn't) SHIMMER's one of the best-produced pieces of independent wrestling I've seen in a long time. Outside of ROH on HDNet, that is, and I have to imagine a lot of the reason for that is HDNet themselves. It also helps that Prazak is there to help make it seem like Mike Hodgewood has actually commentated pro wrestling before, which, admittedly, is a far different creature than your average sport. Dave, have you ever considered doing digital downloads through your website as an optional alternative to the DVDs of SHIMMER volumes? I know many people that simply refuse to buy physical media nowadays who would probably consider purchasing shows if they weren't on a DVD. Also, is there any chance of future SHIMMER volumes being recorded in [non-HD] widescreen? I do wonder how many other SHIMMER fans have widescreen TVs and PCs that they watch their DVDs on. The entire SHIMMER library has been available as digital downloads since the promotion began. Most SHIMMER matches are available. But let's say someone wanted to download every match from a certain volume. Even if they could find every bout on the card, it's just unreasonably expensive. Rather, I'm throwing out the idea of having an entire volume downloadable and available the same date and price as the DVD. This would create an alternative to ordering and having a physical disc sent to your home. It would please those that refuse to buy DVDs, and in a way would be a less wasteful and cheaper alternative as far as production is concerned. And there are video compression tools that are able to keep the file to a reasonable size while maintaining a high-quality appearance. 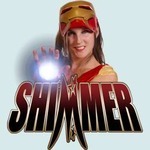 I was wondering if anyone at SHIMMER had considered this as a possibility. Less people purchasing DVDs is a reflection of the direction that the market has been going for quite some time. CD, DVD, and video game disc sales have been, and still are on the decline in favor of downloadable media. The inclination to not buy DVDs is because, for so many people these days, it is much easier to download something than to deal with shipping and storing a physical product. And these people, like myself, mainly use their computers to watch media with, or even as their main home theater component. I would rather not deal with having plastic cases taking up space in my house when I could just download any SHIMMER volume to my hard drive. Another option would be to have all of the volumes available in streaming form on a website. GoFightLive (that offers ROH PPVs) has a good stream quality, and once you buy an event you can watch it as many times as you want. This could also be an alternative for those against buying physical media. I am curious what Dave thinks about this. What about the idea of streaming the events online? There's no hard drive space taken up, no chance of accidentally deleting it, no materials to 'discard', and nothing to back up. And you can watch it whenever you want. Plus there's no worry about file sharing. As well, ROH has found great success with streaming their events on GoFightLive. There are enough advantages to market the idea to potential new SHIMMER fans (or even current fans). I feel that there could be a chance with to create an alternative for people that desire to watch the events in a different format and have money to offer SHIMMER. If streaming events could potentially be another source of revenue for this company then it deserves to be considered. I just don't see it as such a financial risk to toss one show up as a stream purchase in order to test the waters. As for file sharing, far less people know how to rip and save a secure video stream than know how to rip a DVD. I am familiar with popular file-sharing sites, and stream rips are extremely rare to come by. Not so with DVDs. So SHIMMER would actually be helping itself to prevent file sharing by streaming events. ROHWrestling.com allows fans to download DVDs on demand. Since ROHWrestling.com already sells SHIMMER DVDs, why not test the waters with on-demand on their website as well? I just don't see it as such a financial risk to toss one show up as a stream purchase in order to test the waters. As for file sharing, far less people know how to rip and save a secure video stream than know how to rip a DVD. I am familiar with popular file-sharing sites, and stream rips are extremely rare to come by. Not so with DVDs. So SHIMMER would actually be helping itself to prevent file sharing by streaming events. All it takes is for one person to secure a video stream and distribute it to alot of people who don't know how to. How are those other DVDs going to be bought when people are passing around a ripped/saved video stream? ROH runs multiple shows each year and they sell hundreds/thousands of seats to shows every weekend. SHIMMER doesn't. They only get 200 seat ticket revenue a couple of times a year. It would be a much bigger risk to let fans stream or download DVDs from SHIMMER and it's not worth possibly killing the promotion just because you want to clear space in your DVD shelf. How are those other DVDs going to be bought when people are passing around a ripped/saved video stream? The same way that DVDs are being sold today even though there are many DVD rips being circulated on file sharing sites. To put things into perspective, file sharing happens no matter what format a wrestling event is released on. And DVDs are one of the easiest formats to share. I just can't assume that a promotion would be killing itself because it wanted to offer the same successful business model of a company that they are partnered with. I more so see a company killing itself for limiting itself to aging technologies. I'm not saying that SHIMMER should stop selling DVDs, but they may be able to benefit from alternative methods of income that don't require any significant financial risk. I absolutely agree with theshape31. Digital downloads are going to kill the DVDs the same way it killed the music cd's. I would love to have an option to legally download the Shimmers DVD's, I am sick of having to wait weeks for the DVD's to arrive by snail mail to my country.